When you think of decorating a wall, the first thing that will come to your mind is hanging a few paintings and leaving it at that. But, there will be nothing unique about your walls if you follow the same old idea. You will have to think of hanging something else than the framed pictures. If you are a guitarist, try hanging your guitar on the wall. You can also hang other music instruments to entice the guests visiting you. Make a pattern by hanging beautiful hand painted plates. This will add colour and liveliness to the walls. Mirrors reflect light and are also beautiful when placed strategically. You can use antique mirrors to make the wall look interesting. Do not hang boring plain mirrors. Go for framed ones that are attractive. You can also put up patterned mirror collages using a variety of them all on one single wall. This is a best idea to create space and a comfortable place to hang out in a cosy room. The recess area provided by an alcove is fun and useful. You can throw in some colourful cushions to make the place super comfy. If you go for smaller alcoves, you can place flower vases or statues to fill up the space. If you do not want the super smooth walls, you can go for a rustic look. The textured walls will have warmth in them. Leave them without colour or plaster for a raw look. You can also use wood to cover up the walls. Just make sure to smoothen the walls using POP from the best Plaster of Paris suppliers to smoothen the walls before placing the wooden slabs on them. Wood will give a welcoming feel to the room. If you are a traveller, there is no best idea than getting a world map drawn on your wall. You can personalise the map by adding small pictures on the map, of your travelling experiences at exactly the places that you have travelled to. This will also be an interesting view for your guests. 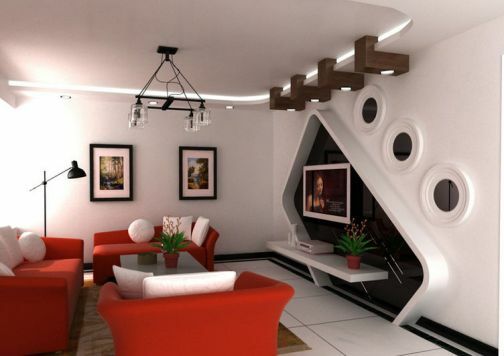 These are some of the ways that you can make your house look attractive and sophisticated. You can also improvise more by adding your own creativity into your space. There is always room for experiment and new ideas.